Hungry Jerks - Food Recipes and Restaurant Reviews: Red Planet Diner in Sedona AZ is...OUT OF THIS WORLD! Red Planet Diner in Sedona AZ is...OUT OF THIS WORLD! Yeah yeah, could not resist that for the title, but seriously, this place is awesome. Tuesday I informed my wife that we were taking a day trip, no idea where we would go, we were just going to go. 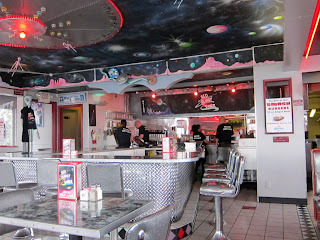 I decided we would just head north until we came across something interesting, and that was Red Planet Diner in Sedona AZ. Sedona is a pretty awesome place. All the rocks and mountains there are red. Its a very beautiful place to visit. I would even wanna live there someday. I always go there once a year during Christmas but its at night to check out the huge Christmas light exhibit. So I've never seen Sedona much during the day. All Sedona appears to be to me is UFO stuff and psychics. Really you can put a blindfold on spin in a circle and throw a rock and you'll hit a psychic shop. They're everywhere. 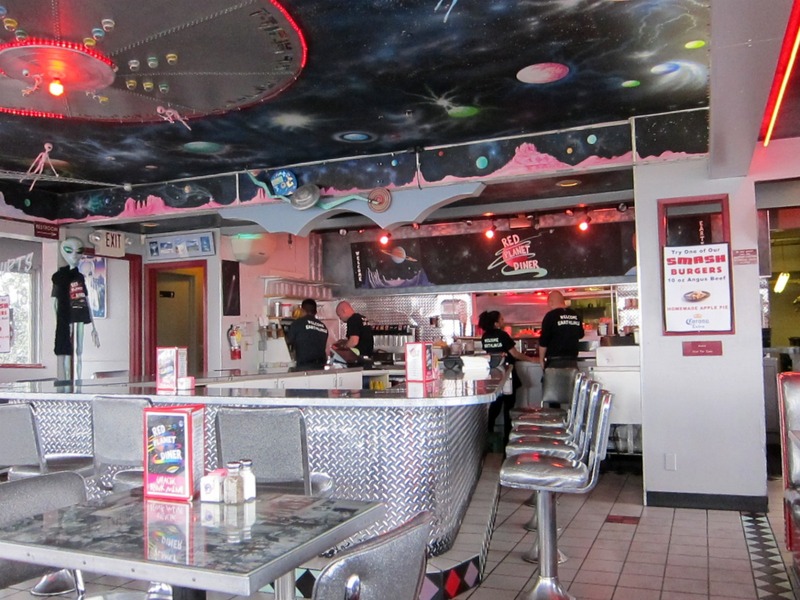 We came across Red Planet Diner after using Urbanspoon and finding it on there. The geekness that runs deep in us could not resist. They have a pretty massive menu with a crazy choice of burgers. Most of the burgers I read on the menu were unlike any that I have ever seen before. They have something for everyone here. Burgers, steaks, meatloaf and shrimp, ribs, sandwiches, awesomely named alcoholic concoctions. This place has it all. We decided to keep it simple and try the signature Red Planet Burger. Charbroiled with some cheddar cheese on a toasted bun. That pretty much owned my heart with that. One of the best burgers I've had in quite a long time. This place has a fun atmosphere, is easy to find, and has a large variety of food that Im sure tastes great. If you ever find yourself in Sedona AZ, you owe it to your stomach to check this place out.